Reprint. Originally published: London: Dobson, 1968. The very first book about Elmer the patchwork elephant, now available for the first time as a miniature hardback. Full of colour, wisdom and pathos, little readers will love this classic tale at bedtime. 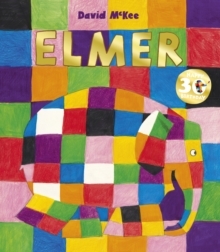 Collect this special 30th birthday edition of David McKee's first book about Elmer, that turned this adorable patchwork elephant into a nursery favourite. With this special edition comes a free audiobook and a beautiful foiled cover. Deservedly a modern classic, with over ten million copies of his books sold worldwide, Elmer's subtle message, that it is ok to be different, resonates with children across the world.